The MLT Program of Maine was created as a collaborative effort between the University of Maine at Presque Isle and the University of Maine at Augusta in cooperation with hospitals across the state that serve as clinical affiliates. Medical Laboratory Technology is a two-year program leading to an Associate of Science in MLT awarded by the home campus. The program’s vision is “Providing Quality MLT Education to Communities Across the State of Maine.” All MLT lecture courses are available via videoconferencing at locations statewide. Periodic intensive laboratories will be held at the Presque Isle or Augusta campuses. The final semester is a supervised clinical practicum scheduled at an affiliated hospital laboratory. There is a strong need for medical laboratory technicians as approximately 40% of the current laboratory workforce is within five to ten years of retirement. You will be prepared to ensure ongoing delivery of quality healthcare to communities across the State of Maine. The MLT Program of Maine includes Canadian alumni that have trained in the United States and have become certified through the Canadian Society of Medical Laboratory Science (CSMLS). Upon completion, graduates are eligible to take the certification exam administered by the American Society of Clinical Pathologists (ASCP) or the American Medical Technologists (AMT). Medical laboratory technicians (MLT) are vital to the healthcare team as they are often the first to produce patient results. MLTs use sophisticated biomedical instrumentation, as well as manual procedures, to perform testing and provide results that are essential in the diagnosis, treatment, and prevention of disease. It is estimated that over 70% of all medical decisions are based in part on laboratory results. The medical laboratory technician has diverse and multi-level functions in the areas of collecting, processing, and analyzing biological specimens and other substances, principles and methodologies, performance of assays, problem solving, troubleshooting techniques, correlation of clinical procedures and results, principles and practices of quality assessment for all major areas: clinical chemistry, hematology, immunology, immunohematology, microbiology, and molecular biology practiced in the contemporary clinical laboratory. Medical laboratory technicians practice independently and collaboratively, being responsible for their own actions, as defined by the profession. They have the requisite knowledge and skills to educate laboratory professionals, other healthcare professionals, and others in the laboratory practice as well as the public. The ability to relate to people, a capacity for calm and reasoned judgment, and a demonstration of commitment to the patient are essential qualities. Communication skills extend to consultative interactions with members of the healthcare team, external relations, customer service, and patient education. Laboratory professionals demonstrate ethical and moral attitudes and principles that are necessary for gaining and maintaining the confidence of patients, professional associates, and the community. Adapted from NAACLS: Unique Standards of the Medical Laboratory Technician. The MLT Program of Maine admits a maximum of 30 new students (15 at UMPI and 15 at UMA) in the fall semester of each academic year. Provide official transcripts of all colleges attended. Courses with a grade of “C-” or better should transfer to the University. Note: The MLT Program is science-intensive and students must achieve a minimum grade of 77% or C+ in all science courses. Note: Students interested in the program who do not meet the entrance requirements are invited to contact one of the Program Co-Directors, the advising department, or the admissions office for assistance in identifying methods to obtain necessary courses required for the program. We ask all potential MLT students to write an essay addressing the following questions. Why are you interested in the MLT Program? You may comment on previous experiences (work or personal) that have influenced your decision to enter this field. What qualities do you possess that will help you to be a good MLT? It is highly recommended that if you have not had an opportunity to visit a clinical laboratory, please contact one of the Program Co-Directors for more information on scheduling a visit. MLT graduates may upgrade their professional certification to Medical Laboratory Scientist (MLS) by transferring into the BA Biology program. MLT students entering the clinical rotation component of the program must have a completed current criminal background check on file. If a student’s criminal background check returns evidence of a felony criminal conviction or other serious charges that could result in a clinical affiliate denying clinical rotation access to that student, a review of the situation will be conducted by the program director. Students are advised in MLT 103 that the majority of our clinical affiliates require evidence/validation of a criminal background check as per clinical affiliate/college contract agreements. If a student has a criminal history, the clinical affiliate has the right to deny that student access to its facility and the program must disclose such information to the affiliate and allow the affiliate the right to deny or approve access to said clinical affiliate. Failure to be placed in a clinical rotation would prevent the student from completing the MLT clinical program. In the event that the student feels that an error has been made in the results of the criminal background check, it is the responsibility of the student to contact the external vendor for a verification check. If you have any questions or concerns regarding these requirements, please contact the MLT Program Co-Director. 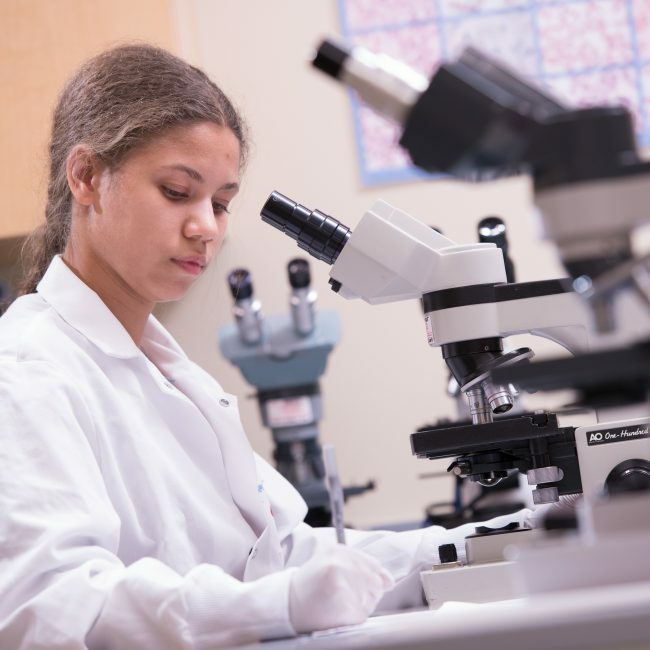 The MLT Program of Maine has established minimum essential requirements (separate from academic standards for admission), which every student must meet, with or without reasonable accommodations, in order to participate fully in all aspects of training and eventual employment in the clinical laboratory setting. These essential requirements are divided into observational, movement, communication, intellectual, and behavioral categories. Observational – Ability to participate actively in all demonstrations, laboratory activities, and clinical experiences in the professional program component. Such observation and information requires functional use of visual, auditory, and somatic sensations. Observe laboratory demonstrations in which biologicals (i.e. body fluids, culture materials, tissue sections, and cellular specimens) are tested for their biochemical, hematological, immunological, microbiological, and histochemical components. Characterize the color, odor, clarity, and viscosity of biologicals, reagents, or chemical reaction products. Employ a clinical binocular microscope to discriminate among fine structural and color (hue, shading, and intensity) differences of microscope specimens. Read and comprehend text, numbers, and graphs displayed in print and on a video monitor. Movement – Sufficient motor ability to execute the movement and skills required for safe and effective performance of duties. Move freely and safely about a laboratory. Reach laboratory benchtops and shelves, patients lying in hospital beds, or patients seated in specimen collection furniture. Travel to clinical laboratory sites for practical experience. Perform moderately taxing continuous work, often requiring prolonged sitting or standing, over several hours. Maneuver phlebotomy and culture acquisition equipment to safely collect valid laboratory specimens from patients. Possess finger and manual dexterity necessary to control laboratory equipment (i.e. pipettes, inoculating loops, test tubes), adjust instruments to perform laboratory procedures, such as handling small tools and/or parts to repair and correct equipment malfunctions, and transferring drops into tubes of small diameter. Use a computer keyboard to operate laboratory instruments and to calculate, record, evaluate, and transmit laboratory information. Communication – Ability to communicate effectively in English using verbal, non-verbal, and written formats with faculty, other students, clients, families, and all members of the healthcare team. Follow verbal and written instructions in order to correctly and independently perform laboratory procedures. Clearly instruct patients prior to specimen collection. Effectively, confidentially, and sensitively converse with patients regarding laboratory tests. Communicate with faculty members, fellow students, staff, and other health professionals verbally and in recorded format. Independently prepare papers, prepare laboratory reports, and take paper, computer, and laboratory practical examinations. Intellectual – Ability to collect, interpret, and integrate information and make decisions. Possess these intellectual skills: comprehension, measurement, mathematical calculation, reasoning, integration, analysis, comparison, self-expression, and criticism. Apply knowledge to new situations and to problem-solving scenarios. Behavioral – Possess the emotional health and stability required for full utilization of the student’s intellectual abilities, the exercise of professional judgment, the prompt completion of all academic and patient care responsibilities, and the development of mature, sensitive and effective relationships with faculty, fellow students, clinical instructors, patients, and other members of the healthcare team. Manage heavy academic schedules and deadlines. Be able to manage the use of time and be able to systematize actions in order to complete professional and technical tasks within realistic constraints. Demonstrate appropriate judgment and effectively employ intellect under conditions of stress. Be able to provide professional and technical services while experiencing the stresses of task-related uncertainty (i.e. ambiguous test ordering, ambivalent test interpretation), emergent demands (i.e. stat test orders), and a distracting environment (i.e. high noise levels, crowding, complex visual stimuli). Recognize potentially hazardous materials, equipment, and situations and proceed safely in order to minimize risk of injury to patients, self, and nearby individuals. Adapt to working with unpleasant biologicals. Support and promote the activities of fellow students and of healthcare professionals. Promotion of peers helps furnish a team approach to learning, task completion, problem-solving, and patient care. Be honest, compassionate, ethical, and responsible. Accept responsibility and accountability for one’s own actions. The student must be forthright about errors or uncertainty. The student must be able to critically evaluate her or his own performance, accept constructive criticism, and look for ways to improve (i.e. participate in enriched educational activities). The student must be able to evaluate the performance of fellow students and tactfully offer constructive comments. Show respect for diversity: works well with individuals of different age, ethnic background, religion, sexual orientation and/or educational backgrounds. Exhibit professional behavior by conforming to appropriate standards of dress, appearance, language, and public behavior. Adapted from Fritsma, George A., Fiorella, Beverly J. & Murphy, Maryrose. (Jan/Feb. 1996). Essential Requirements for Clinical Laboratory Science. Clinical Laboratory Science, 9, 40-43. Graduates of the MLT Program of Maine are eligible for national certification as Medical Laboratory Technicians (MLTs). The following table lists the number of graduates, number of first-time examinees, number of first-time exam takers who passed the exam, and the percentage of first-time pass rates for program graduates within 12 months of graduation. The following table lists the graduation rates for students of the MLT Program of Maine that began the second half of the program (defined as fall semester of the second year – MLT 204, MLT 205, MLT 206). The following table lists the program graduates that found jobs in the medical laboratory science profession within 12 months following successful completion of the program and the number of graduates that continued their education.